This is the best and preferred method to dissolve a Labuan Company. However it is the most expensive amongst the two methods. Any surplus cash of the Labuan Company is to be distributed to its shareholders subject to the company Memorandum and Articles of Association. More-often it is distributed based on the shareholding percentage. Prepay all company secretary fee and invoices for assisting in the voluntary winding up. Prepay LFSA Fees in the voluntary winding up. A Tax Clearance notice from Lembaga Hasil Dalam Negeri (LHDN) that is has no objection to LFSA making a declaration of dissolution of the company. Fee of USD 2,000 (assuming the exchange rate of USD1.00 = Ringgit 4.00) or Ringgit 8,000 payable to LFSA. Corporate Services Trust Company professional fee for this purpose will be USD 1,000 exclude Out of Pocket expenses. For more complicated case such as the company with very long history in business our professional fees will be higher in commensurate with the complexity and time cost. On top of our fee as stated above the liquidator fees is also payable. The liquidator fee in general is USD 3,000 exclude out of pocket expenses. For more complicated case such as the company with very long history in business our professional fees will be higher in commensurate with the complexity and time cost. If there is no objection received from any party of the above, LFSA may approve the dissolution application less than 3 weeks after 30 days notice. The Declaration of Dissolution Notice publication issued by LFSA is valid for six (6) years. Any creditors claim or person to be interested may apply to Court within the validity date of 6 years to revoke the dissolution. Prepay all company secretary fee and invoices for assisting in the strike off. All Labuan companies are required to pay LFSA annual fee of Ringgit 2,600 one month before anniversary date of the date of incorporation. The Labuan Company may appeal to Labuan FSA to extend the period subject to LFSA approval. Once the name has been struck off the register continuously for a period of 3 years, the Labuan Company is deemed to have dissolved. Once the company is struck off, the directors can apply to Inland Revenue to close the corporate tax file and all other tax files. During the process of striking off, Labuan Company is liable to compliance with yearly tax filing even when the company is dormant or inactive. 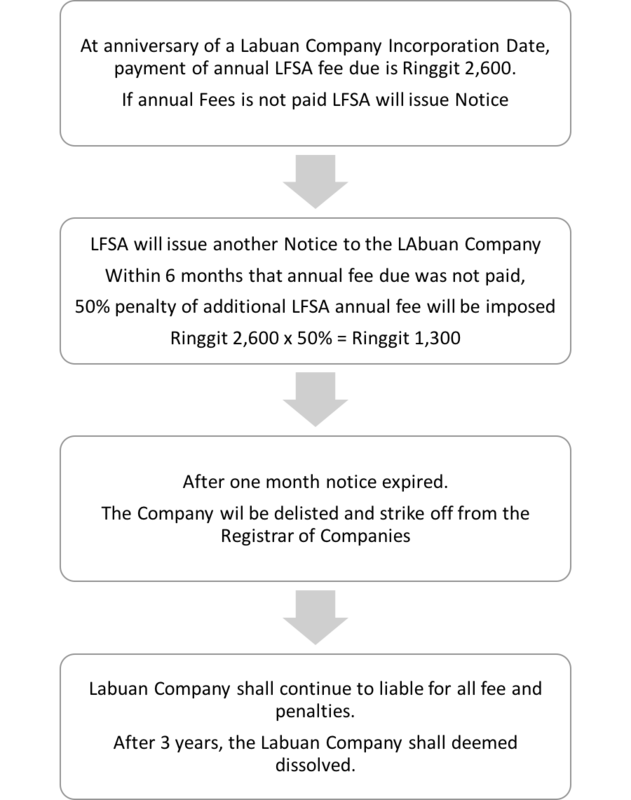 Default Annual Fee Payment with Labuan FSA under Section 151 of The Labuan Companies Act 1990 is not applicable to a Labuan company in the process of being wound up and dissolved. Previous ArticleWhy Incorporate a Labuan Company? Next Article WHY MIGRATE YOUR EXISTING COMPANY FROM OTHER JURISDICTION TO LABUAN IBFC?